A “stretched” painting has been pulled tight and stapled over a wooden framework. It’s not the same as “framing” a painting. A frame is a decorative part that shows, while the wooden framework on the back, which is made of four or more “stretcher bars,” is what literally stretches the painting flat and holds it in its final shape. 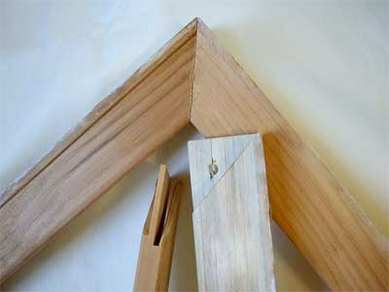 Stretcher bars aren’t visible, but a frame is. Why would I want to stretch my painting myself? Stretching a painting is a quick and easy one or two person project that saves you a ton of money. And even having someone else stretch your painting after you receive it is usually much less expensive than having it shipped pre-stretched. Sure is. One person can do it with minimal tools in about an hour. Can I get someone else to do it? Sure thing. If you don’t feel comfortable tackling the job yourself, you can take your painting to a local frame shop or try asking at a local art supply store to see if someone there might do the job for you. An artist, art student, or art teacher are also good bets for inexpensive service. If you do decide to let a professional frame shop handle the job, shop around. We’ve found estimates ranging from $100 to $600 for the same piece. What does it cost to stretch a painting yourself? Smaller paintings cost less, and larger paintings cost more. Stretcher bars for a 24″ x 24″ painting will cost about $17, while a 60″ x 60″ will cost about $99. For a hypothetical 24 x 48 inch painting, you’ll spend about $51 for stretcher bars, and a decent staple gun will run you about between $7 and $15 dollars, if you don’t already have one. 4 stretcher bars and the appropriate number of cross braces – cost: $17-$87, depending upon the size of your painting. You need cross braces if one of your finished painting’s dimensions will be over 36 inches (one every 18 to 24 inches is recommended). For our hypothetical 60″ x 48″ canvas, you’ll need two cross braces. We like these stretcher bars and these cross braces, which we’ve found to be inexpensive and of reasonable quality. They may be a little more expensive than some other brands, but they come with brackets, a savings of $7 per brace, while other brands may not come with brackets. A staple gun with staples – cost: $8 to $15. If you don’t have one already, this is a must. They’re inexpensive and handy to have around the house after your stretching project is finished. We like the this one, because it’s easy to squeeze the trigger. It costs comes with 400 staples, way more than you need. This one costs even less—about $8—if you already have a supply of staples. What if I start the project and run into trouble? We’re available by phone in case you need extra help, but it’s such an easy project that you probably won’t need us. Fewer than 1% of our collectors have asked for help. Stretching a painting yourself really is fast, fun, and easy. So let’s get right to, then! Step One: Gather Your Materials. a set of stretcher bars (and cross braces, if needed) (See “A Note About Stretcher Bars and Dimensions” at the bottom of this page. Step Two: Assemble the stretcher bars. The bars simply slide together to form a rectangle. They usually fit together pretty tightly, so you’ll have to tap them together using your hammer or mallet, taking care not to break the ends of the stretcher bars, which can be fragile. The cross braces (if your painting is large enough to need them) are placed in the center. The ones we recommend above come with brackets that easily screw into the stretcher bars. If you match up all four corners of the stretcher bars carefully, the corners of framework you’ve created will all be square. It’s best to check one using a T-square, a large book, or anything else that you know has a 90 degree angle. Adjust your stretcher bars as necessary. Step Three: Staple the corners of the stretcher bars. Still working on the back of the assembled framework, place three staples where the blue lines are in the picture below. Do this on all four corners. Step Four: Lay out your painting and assembled stretcher bars. Spread your blanket or sheet out on a level, flat surface larger than your painting. 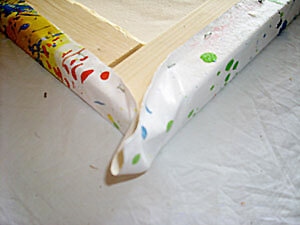 Put your painting right-side-down on top of the blanket or sheet. Put your stretcher frame on top of the painting. Be sure your frame is centered on top of your painting. If your stretcher bars are 1.5 inches deep, you’ll need at least 2 inches of extra canvas on each side of the stretcher bar framework. If you need to put in a cross brace or two, do it now. The brackets that come with your cross brace screw into the stretcher bars quite easily using the included screws. Step Five: Begin stapling your painting to the stretcher bars. 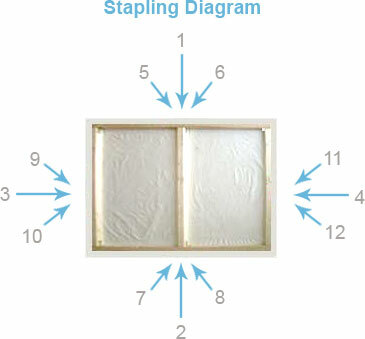 Staple once in the middle of each side, pulling tight, and then simply follow the stapling diagram below. As you move toward the corners, take care to smooth away any large ripples in the canvas. Pull tight, and take breaks; it’s a workout for the fingers! Stop stapling about 6 inches from each corner. NOTE: Having a friend to help you makes this job a lot easier: one person pulls with the fingers while the other staples. An electric staple gun (versus a manual one) is also big help. If you can’t borrow one, do consider buying one. It’ll cost you about $15 more than a regular, manual staple gun, and they usually shoot brads as well as staples, so they’re great for all sorts of home-dec projects. 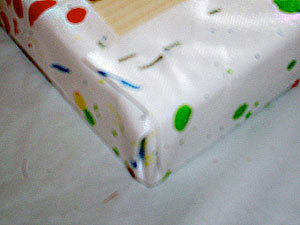 Step Six: Wrap up those corners. Step Eight: Take care of wrinkles. Turn your painting over and look at the front. If you’ve been careful, there shouldn’t be any wrinkles in your painting at this point. But even if there are some small ripples in your painting, we have a trick that should eliminate them completely. First, use your hammer to tap in any staples that are sticking out from the back, and then it’s time to employ our hot water trick. First, spray the back of the acrylic painting (don’t try this with an oil painting!) with very hot water (not hot enough to burn your skin, please!). 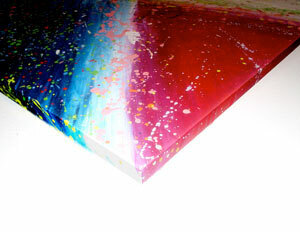 As the water dries, the canvas will shrink just a little, and the painting will develop a smooth, taut surface. Step Nine: Give your painting a tune-up. If your painting’s canvas is nice and taut at this point, you should skip this step. If not, find the little wooden wedges that came with your stretcher bars (they’re called “keys”) and insert the pointed ends of the keys into the slots in the inside corners of the stretcher frame. Slip them into the holes on the inside corners and lightly tap them in with a hammer, stretching the canvas to the desired amount of tension, being careful not to overdo it (which could tear your canvas). The keys aren’t supposed to go all the way in; they’ll stick out, but that’s okay, as they’re on the back of the painting and won’t show. If you need to see a video of this process, here’s a good one. Even if you skip Step Nine, keep the keys. Your painting may loosen up months or years from now, and you can either repeat Step Eight or employ Step Nine to tighten it back up again. A good place to store the keys is hidden behind the painting. Just staple the little zip bag they come in to the back of the painting’s stretcher bars, and they won’t get lost. That’s it! All that’s left is to hang your painting on the wall and enjoy it! Stretcher bars are the four pieces of wood that make up the the wooden framework on the back of the painting. The canvas of the painting is stretched over them and stapled onto the wooden stretcher bars. If you are going to stretch a painting yourself, you’ll want to pay attention to the painting’s “un-stretched dimensions.” Those dimensions represent the entire length and width of the un-stretched, painted canvas, not the finished, stretched size of the painting. After stretching, the dimensions will be smaller. With a gallery wrap, the painting is stretched around the sides of the bars and is stapled on the back. A gallery wrapped painting doesn’t need a separate, decorative frame. Using a gallery wrap, you’ll lose up to 6 inches of the painting’s un-stretched dimensions, depending upon how deep the bars are. Gallery wrapped paintings are stretched on stretcher bars ranging from .5″ deep to 6″ deep, but most gallery wrapped paintings use stretcher bars that are 1.5″ deep. 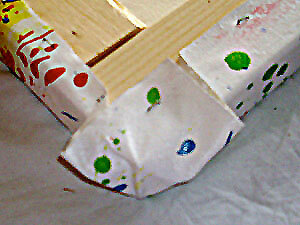 A “studio wrap” is where the painting is stapled to the sides of the stretcher bars, rather than to their backs. The painting is then surrounded by a decorative frame that conceals the stapled sides of the painting. With a studio wrap, you’ll lose only 1 to 2 inches from the painting’s un-stretched dimensions, rather than 5 or 6 inches, but you have the added cost for a frame. Most studio wrapped paintings use stretcher bars that are .5″ or 1″ deep. Canvas pliers (we like these) are handy for doing a studio wrap and eliminate the need for having a helper. n + 3 = the final dimensions of your painting. With this example, the un-stretched dimensions would be reduced by 6 inches, so the finished painting would have final dimensions of 54 x 42 inches. If you were ordering stretcher bars, you’d have to order two 54″ bars and two 42″ bars, plus a single 54″ cross brace.